The Swan in Clewer, Windsor has been closed for over three years. We now own it and have started the required renovation work required. Our vision is to restore it as a local pub, a real community hub and as a social enterprise assisting young people with additional needs. However, The Swan needs significant work by us - this is being funded by the local community. We have another day planned where supporters and the local community can come along and help restore The Swan to its' former glory. There is only one session this time, starting at 9am. You must complete a brief safety induction before commencing work on site. As before you must pre-register, all details can be found on the volunteering page. This will be followed by a fundraising BBQ with beer in the evening. We are pleased to announce our first fun event at The Swan. We are opening the gates to all for an evening courtyard event from 5.30pm to dusk (about 8.30pm). To raise funds, we will be having a bar and a BBQ, both will be reasonably priced. All profits will go to our Renovation Funds. And probably one or two surprises too. We hope to see you there! If you are thinking about attending, please could you complete this short form. It will give us an idea of how much food and drink we will need to get. Unfortunately the buiding is not yet wheelchair friendly and has no disabled access. Do not attempt to climb any part of the scaffolding or climb out on to the roof. Report any accidents or incidents to one of clearly identified Swan Volunteers. Be aware that there is limited toilet facilities on site. Access to the toilet will be clearly marked, please remain on the marked route. There will be guided tours of the building, do not look around on your own. If on the building tour, please wear the hard hat and hi-viz jacket provided. Do not enter areas that are marked as having either restricted or no access to the public. Advise the photographer if you do not want to appear in any photographs or videos. Ensure children are adequately supervised at all times. Dogs are kept on the lead and under control. Wear appropriate footwear, especially if the weather is inclement. If there is a fire or klaxon, please evacuate The Swan as directed by Swan Volunteers. Do not interfere with any of the electrical equipment or appliances. If there is inclement weather, we may have to postpone the event at short notice. The BBQ is outside only, please wear appropriate clothing. Your safety is our prime concern. Please speak to one of the Swan Volunteers if you have any doubts or questions. WE DO HOPE YOU ENJOY THE EVENING. Final decisions have been made on the bar layout, and the ball is rolling in the relevant restructuring work which is needed. 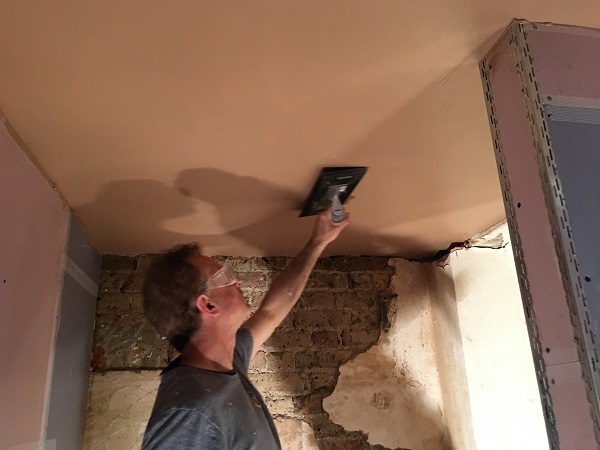 Peter our builder has made good progress on interior of both pub toilets, with stud work going in. The Fire Report" is due Friday 12th, the inspection was actually done last week. The electricians will be starting in full swing next week, with the first fix to the toilets and school room. Timber and fireboard has now started arriving for work to keep progressing. The plan for the bar area has been submitted to the commercial planning department for the area. We have the help of some very special people and businesses. we would not be able to make so much progress at such a cost without them. 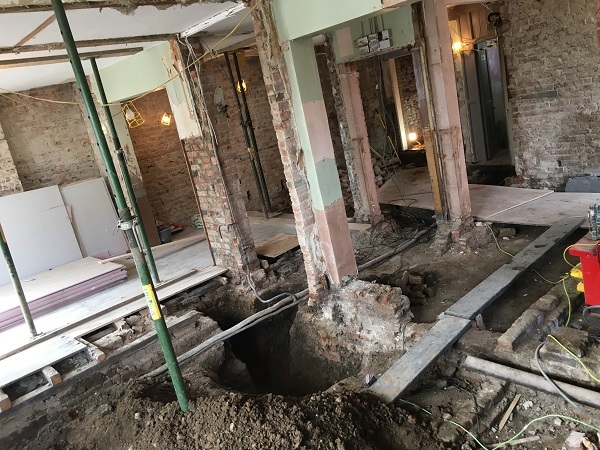 This is vital for the renovation so it doesn't spiral out of control. And no, it' not an April Fool's Day prank. It's 100% true and not something done by Photoshop or the likes. 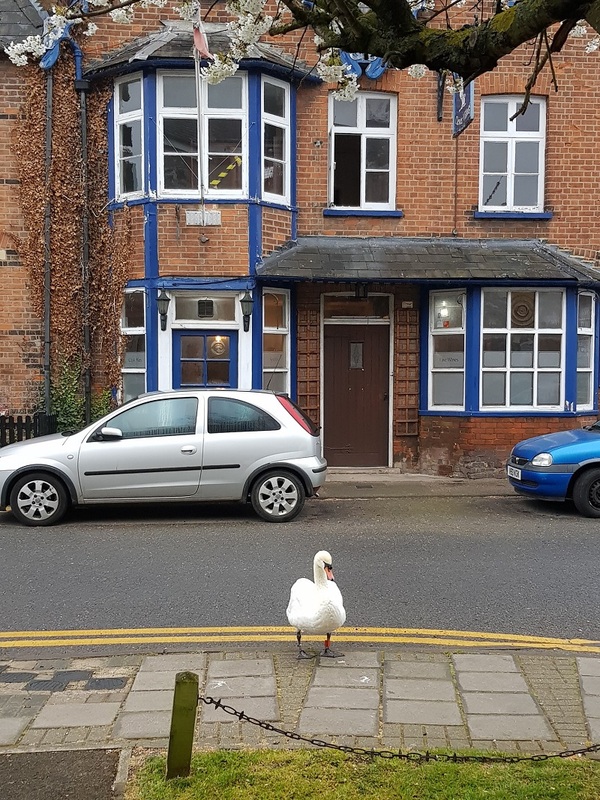 On Tuesday 2nd, a poor swan managed to get totally confused and landed outside the swan. 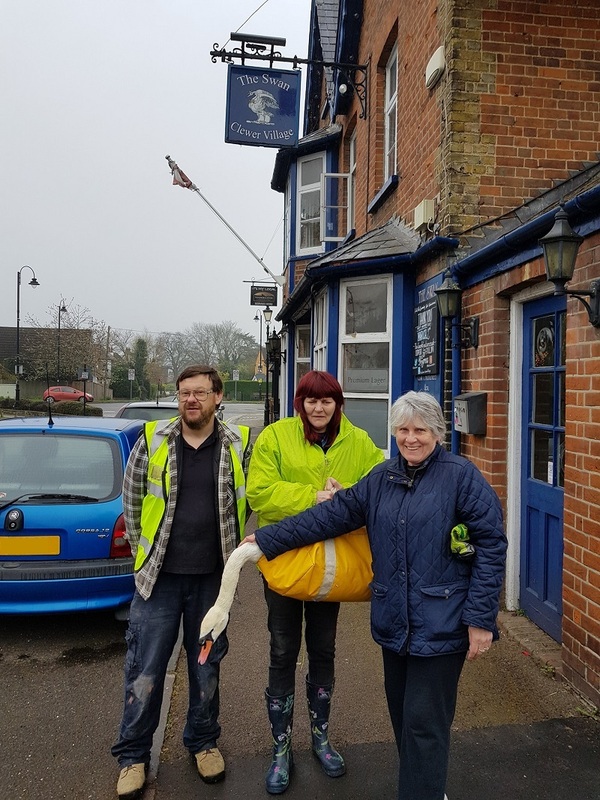 Luckily Ian Birch (volunteer) and Carol Meakin (our old landlady and also a volunteer) were at hand to contact The Swan Lifeline. They responded very quickly and rescued the sawn. But oh what a photo opportunity! 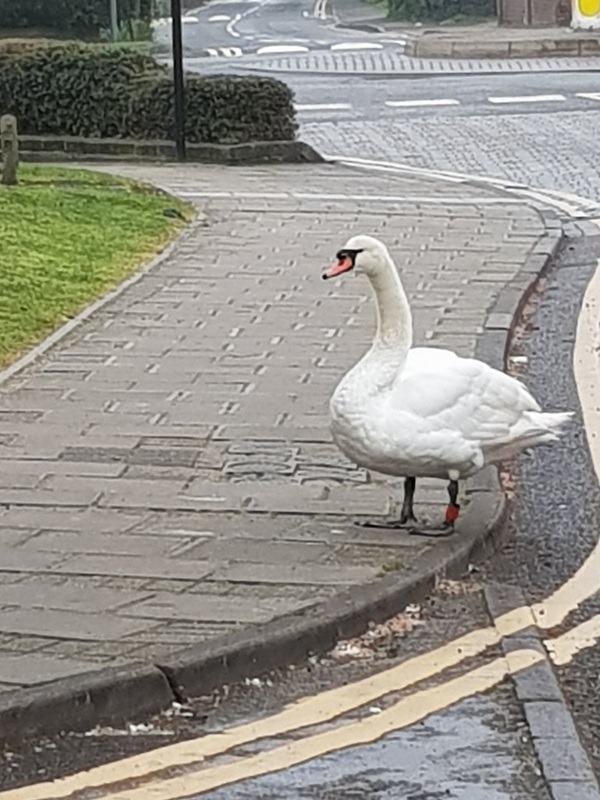 A swan at The Swan. Unfortunately slightly too early for the opening ceremony. At that age should know better! All the 250 Founder Shares have now been allocated. So far we have raised £250,000 in shares and just over £20k in loans plus a further £2k in donations. The grand total as of Friday 12th April stands at £272,816.50. Our Prospectus is now available. Want to keep up-to-date with what is going on with Supporting Our Swan? It couldn't be simpler! You can join our emailing list and receive regular updates from us. Having any issues receiving our emails? Please have a look at the FAQs. The Swan always been more than just a watering hole for thirsty locals. Situated on Mill Lane within the Clewer Village area of Windsor, it's a leisurely 20 minute walk from Windsor Castle. The Swan dates from the 18th century, and during its long history has served as a coaching inn and courthouse. It's also been known variously as The Swan Inn and The Swan Hotel too. According to local folklore, there is a tunnel linking The Swan to the local church of St Andrews. 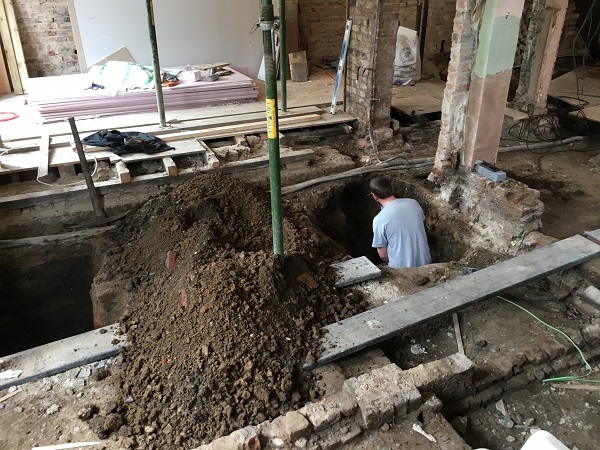 There is a debris filled hole within the pub which is claimed to be the entrance. Whether this is true, or one of the Victorian pranks common in Windsor, is unclear. Around the 1870s, the coroner held inquests and post mortems at The Swan for those that had drowned in the nearby Thames. It is said that the last journey of those unfortunate souls was through the tunnel to the church. Being close to the Thames Path for walkers, National Routes 4 and 61 for cyclists, and the Royal Windsor Racecourse means that this community hub is never too far from the action. It finally closed in 2016. Now it's our turn to open its doors and write the next chapter in its long-standing history.